You can access time-sensitive announcements and news from AFP South Sound on this page dating back to the launch of our new website in April 2018. To submit an announcement, email the Chapter Administrator at afpsouthsound@gmail.com. 2018 AFPSS president James Plourde, CFRE, shares his take on the word love as it relates to philanthropy, our community and learning. The 2019 proposed slate of AFP South Sound board members is available for review and will be available for a vote by the current membership at the 2018 Annual Meeting on Dec. 5, 2018. Chapter scholarship applications for AFPSS members who have never attended the AFP International Conference are available now through Oct. 6, 2018. 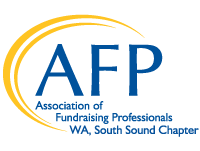 Special member pricing for AFP South Sound and South Sound Planned Giving members ends Sept. 15. Limited scholarships are available for AFP South Sound and South Sound Planned Giving Council members to attend the South Sound Philanthropy Summit. Check out photos from our July picnic and be sure to join us in December for our next member social! Mentors have applied for the second round of the AFPSS Mentorship Program (you can see the mentor bios here), and the mentee application is now open through July 12, 2018. Planning to have your headshot taken at the July 18 summer BBQ? These tips from LILT will help you prepare for the best updated photo your LinkedIn profile has ever seen! The AFPSS Mentorship Program is kicking off its second round, and all AFPSS members are invited to participate! The mentor application is open now through May 31, and the mentee application will be open June 5 – June 30. AFPSS members can receive the member rate for the Advancement Northwest Forum on Strategic Fundraising, June 7-8. Several South Sound members are presenting at this year's Forum and the full speaker line-up is not to be missed! Check out the program and then get your discount code at the link below for registration.